Lord Voldemort together with his Death Eaters continue with their reign not only in the wizarding world but also on the Muggle World when a series of attacks in both realms are reported. 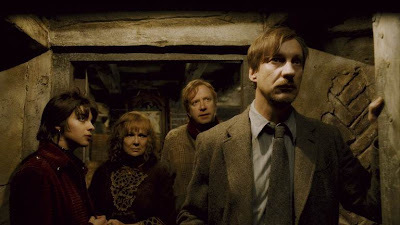 Harry Potter (Radcliffe), worried that problem is somehow conceiled in Hogwarts' walls itself, Dumbledore (Gambon) is more focused on preparing him for the final confrontation with the dark Wizard. Convinced that the key to their success is on the hands of a long time friend and ex-potion professor Horace Slughorn (Broadbent), Dumbledore tried his best to convince him to go back in Hogwarts and teach. Now, as Harry try to persuade Slughorn to reveal Voldemort's secret, they didn't know that a tragedy will change everything and Hogwarts will never be the same again. 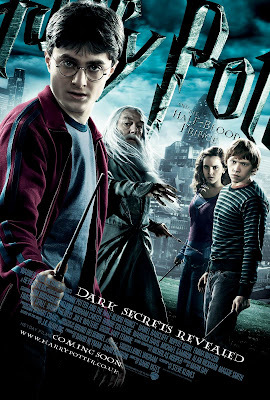 Based on the 6th installment of the J.K. Rowling's fantasy novel Harry Potter. David Yates is back for another round in Half-Blood Prince together with the main cast regulars EmmaWatson (Hermione Granger), Rupert Grint (Ronald Weasley) and Daniel Radcliffe (Harry Potter). Ever since the first teaser trailers came out, people know that the Harry Potter 6 hype is pushed to the limits. 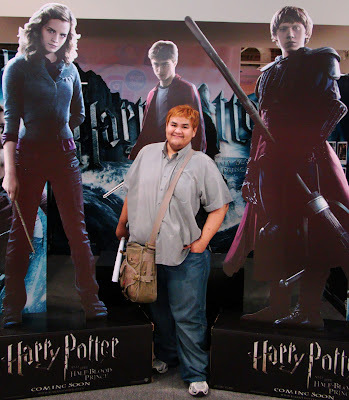 Despite the growing fan base of Twilight, Harry Potter stayed as one of the top franchises in the world. It is been 2 weeks since I got the chance to watch this film on an advance screening and think of doing a review right after I watched it. But after the film, I got mixed emotions towards it that it prevents me of writing a decent review. I enjoyed the film. I NEVER READ the book. But I do read fansites and wiki sites to make me well informed of the basic facts on the Harry Potter universe. So I'm bravely saying that the movie is enjoyable. But there is a part of me that says that it is not the best Harry Potter film. So what I did first is I did a research, an in depth research about the 6th book. Too in depth that I found too many discripancies against the film. But just like most movie critics believe including me, A BOOK IS A BOOK, A MOVIE IS A MOVIE. The movie is a seperate entity and considered a seperate universe. So to avoid comparison to the book, my next step is I got my Harry Potter collection of films and I sat in front of my workplace and watch them all once again. And as I finished watching Order of the Phoenix, now I know why Half-Blood Prince is not the best Harry Potter flick. It is because the 6th movie destroys the momentum of the franchise. What do I mean? Despite having different installments. All the movies in Harry Potter franshise is considered a whole. One intact narrative prose. A story that has an exposition (Sorcerer's Stone), Development (Chamber of Secrets), Discovery of Conflict (Prisoner of Azkaban and Goblet of Fire), Climax (Order of the Phoenix and Half-Blood Prince) and Denouement (Deathly Hallows). We know that Climax is the most intense part of a story, but I didn't felt it on this installment. Order of the Phoenix is the most perfect Climax stage of the whole Harry Potter Film franchise and the momentum dropped when I watched half-Blood Prince. WARNING: SPOILERS ALERT. DON'T CONTINUE IF YOU HAVEN'T WATCH THE FILM OR READ THE BOOK. PROCEED AT YOUR OWN RISK. So what makes the film lost its momentum? 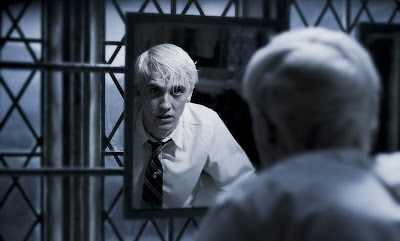 Most scenes are not explained clearly like why is Draco is still permitted to go to the school despite his father's conviction as a Death Eater? Or why is it crossing a river in the Horcrux cave a big problem to Harry and Dumbledore? They are wizard right, they have more than a bunch of ways that they can use to cross that river. They can summon a broom using the summoning charm or just let Dumbledore use the Apparation charm to teleport. But instead they choose to use a sunken boat and waste their time and energy getting it out from the bottom of the river. Yes there are reasons, but they decided not to tell. Not all movie goers are book readers. The readers may know but us, we don't have any idea of what is happening. And the other reason is something that involves the book. Yes, I said I don't want to involve the book as much as possible to the film adaptation but the deletion of this 2 major scenes in the book is unforgivable. The production decided to delete the battle of the Astronomy Tower and Dumbledore's Funeral. Just like what I said, Order of the Phoenix had already set the climax point of the Franchise and I'm expecting a longer and more action packed wizarding duels in the 6th film. But with the omittion of the Battle of Astronomy Tower, my momentum instantly dropped to zero. 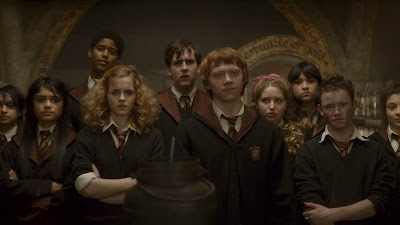 The 6th book's ending is considered as the franchise's turning point for it is considered the start of the final confrontation on the 2nd Wizarding War in Harry potter Universe. But in the good side. I'm happy that at last Draco Malfoy got the spotlight. I used to be curious about this fellow but his character is always reduced to the pure-blood bully that hates Potter. In this flick, he got more screen time and acting pieces. And I should say that he is a good actor that deserves a break outside the Harry Potter franchise. 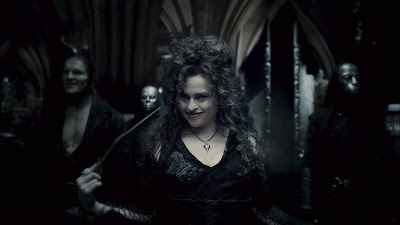 Another actor that fascinates me a lot is the character of Bellatrix Lestrange played by Helena Bonham Carter. She is bad, insane and wicked and definitely one of the best that happens in Harry Potter films. Known for playing twisted characters all through out her career, Carter (now married to director Tim Burton) is indeed the best pick for this dark witch. With the film's shortcomings, Half-Blood Prince can't still be stopped on earning the highest box office record of almost $400 M worldwide in just a couple of days. And despite all the negative reviews, I know people are still looking forward on seeing the last two films. Breaking the last book into two films is enough reason for us to be excited and i'm definitely getting the whole set of book to read it. Half-Blood Prince is still recommended especially to Potter fans. Though I suggest to rather watch it on a regular cinema than IMAX for you may feel sick on most of the 3D scene which is approximately 10 minutes only. Yes, the 3D is not worth it. Distributed by Warner Bros., Harry Potter and the Half-Blood prince is still showing in local cinemas in the Philippines Nationwide.